Upper Deck e-Pack™ is nearing its two-year anniversary and over the course of those two years we have seen this platform grow from a handful of product offerings to encompassing a wide array of trading cards products including sports, entertainment, non-sport, and even Grandeur hockey coins! With so many new users joining every day we thought it might be nice to give some quick tips on how you can get started with e-Pack as well as purchase your first packs! 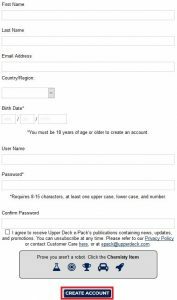 Signing up for an e-Pack account is completely free and easy. 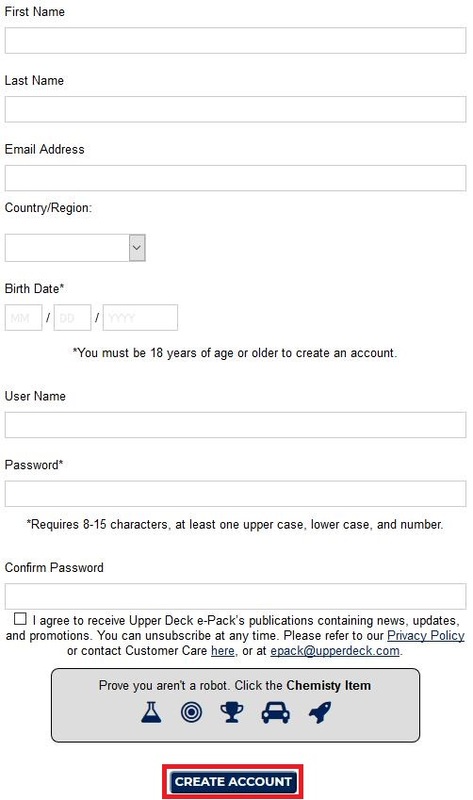 Simply start by going to UpperDeckEpack.com on your computer, tablet or smartphone and click on the JOIN NOW button. Enter in some simple information and click CREATE ACCOUNT. An email will be sent to the email address provided, and you will be asked to verify your account. Click the link provided and you are all set! Buying cards is just as easy! Upper Deck e-Pack™ offers a wide variety of sports and entertainment products that is sure to satisfy any card collector! 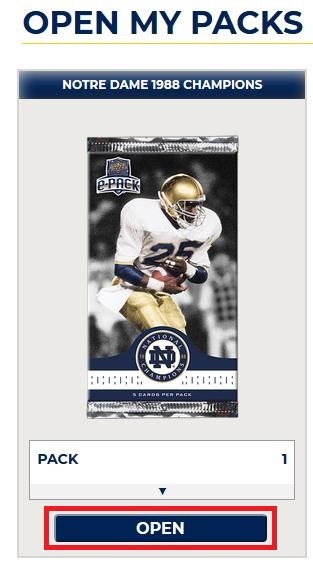 For this example we will use one of the newest products just released to e-Pack, Notre Dame 1988 Champions! 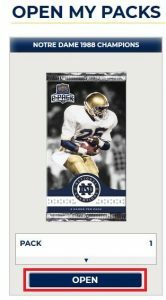 It is an exciting product that commemorates the undefeated 1988 National Champs, led by Hall of Fame coach Lou Holtz and Notre Dame Legends like Raghib “Rocket” Ismail, Tony Rice, Reggie Ho, and more! At the top of left hand side of the e-Pack page click on the STORE tab. This will then take you to the e-Pack store that contains all the current products available divided into subjects. 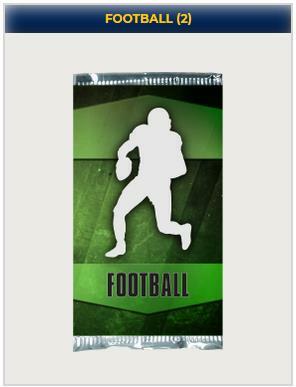 To purchase our Notre Dame packs we would select the FOOTBALL icon as seen below. Once selected, all available FOOTBALL products will be shown. Underneath the product of your choice will be a drop-down menu showing you both the options and pricing for the product. You can select the quantity you wish to purchase and the items will be automatically placed into your shopping cart. You can check out by clicking the SHOPPING CART icon in the upper right hand part of the site. Once there you will be able to finish the transaction with the easy steps that follow. Congratulations! You now have a pack to open! Go to MY PACKS in the upper menu bar of the site and you will see all the available packs, boxes or cases you have to open. Once opened you can see all the great cards you were able to get including any rare inserts, autographs or memorabilia cards. All new cards will be placed automatically in your e-Pack collection for safe keeping until you decide to either ship your cards to you or transfer them to COMC.com and list them for sale. You can then make trades with thousands of other e-Pack users who are available online at any point in time. You can also take cards within your collection, including digital only common base cards and combine them to create exclusive parallels, complete sets and earn rare achievements, and more! Upper Deck e-Pack™ provides boundless opportunities for any card collector, so go ahead and sign up for a free account today!